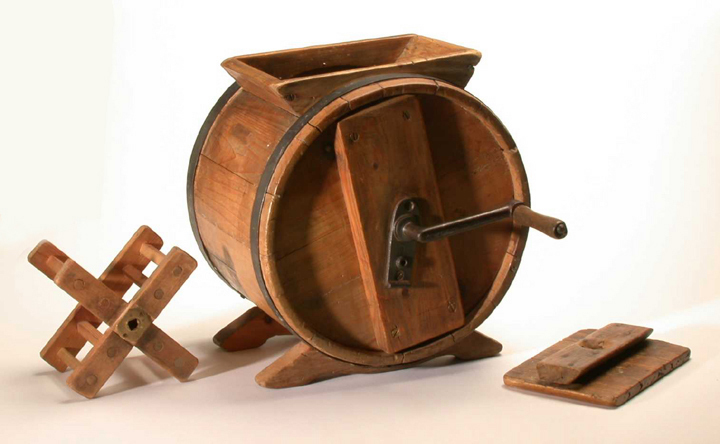 Butter churners like this one were used on many dairy farms in the late 18th and 19th centuries. This churner was known as a box churn, or barrel churn, because it was constructed like a barrel from wood and bound in metal. It was small enough to stand on a table and was used for small-scale production of butter in a farmhouse dairy. It would take a lot of milk - about 70 pints, which is roughly 40 litres - to produce enough cream to make just 18 oz (500gms) of butter. The cream was poured into the opening at the top of the barrel and the handle turned. This would rotate the slatted wooden panels and agitate the cream. There was a small inspection hole in the top of the lid to allow the operator to check the progress of the butter without opening the churn. It would take about an hour and a half to turn the cream to butter. If the cream had not turned into butter in reasonable time it was said to 'have gone to sleep'. The correct consistency was known as 'perfect grain'. Once this was achieved the whey was poured off and either drunk or used as pig food. The butter was then removed from the churn and was washed repeatedly in cold water. It was then beaten with wooden butter beaters or kneaded by hand to remove the excess moisture.